Last week, AGFP served groceries to 128 families. That’s 520 people that had less to worry about. This year brings a lot of challenges to so many families; medical bills, home heating and cooling, stagnant income trends and for some, loss of employment. These burdens can affect any of us at any time. 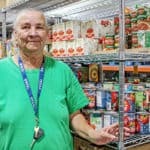 YOU can help lighten that burden for others by arranging a recurring donation or volunteering at Amazing Grace Food Pantry. Your contribution never goes unnoticed. New Building Update: Progress is moving slowly as funds trickle in via donations. Insulation should be complete this week. Next up will be interior framing, along with electrical and some plumbing. If you or someone you know is an electrician, we need your help! Please call 972-292-7241 to leave a voicemail message.